Bella’s Cookie Patch features homemade goodness in every bite! 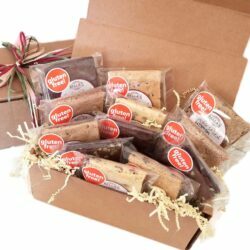 This gift includes six (6) or twelve (12) of your chosen varieties of Brownies, Cookie Bars, and/or Cookies, individually wrapped and packaged in an attractive gift box. Perfect for sharing! Please note: In order to assure freshness, our cookie patch gifts are baked and shipped only once each week. Orders placed by Monday each week will be shipped on the following Wednesday. 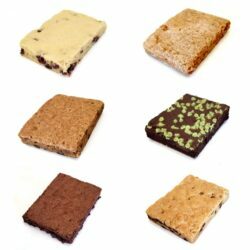 Allergy information: All Bella’s Cookie Patch items could contain trace amounts of tree nuts and or peanuts. Bella’s Cookie Patch items are individually wrapped. 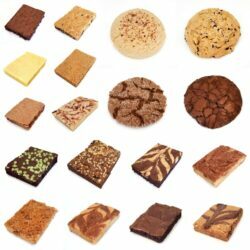 You choose your favorite assortment! Ingredients: Sugar, Unbleached, Unbromated Wheat Flour (Wheat Flour, Niacin, Iron, Thiamin Mononitrate, Riboflavin, Folic Acid, Malted Barley Flour), Eggs, Salted Butter, Lemon Oil, Baking Powder, Salt. Nutrition Facts: Serving Size: 1 oz , Calories 112, Fat Calories 43, Total Fat 5g, Sat. Fat 3g, Trans Fat 0g, Cholest. 31mg, Sodium 69mg, Total Carbs 16g , Dietary Fiber 0g, Sugar 10g, Protein 1g. Ingredients: Sugar, Light Brown Sugar, Unbleached, Unbromated Wheat Flour (Wheat Flour, Niacin, Iron, Thiamin Mononitrate, Riboflavin, Folic Acid, Malted Barley Flour), Eggs, Salted Butter, Cinnamon, Vanilla Oil, Baking Powder, Salt. Nutrition Facts: Serving Size: 1 oz , Calories 111g, Fat Calories 28g, Total Fat 4g, Sat. Fat 3g, Trans Fat 0g, Cholest. 28mg, Sodium 62mg, Total Carb 17g , Dietary Fiber 0g, Sugar 12g, Protein 1g. Ingredients: Brown Sugar, Unbleached, Unbromated Wheat Flour (Wheat Flour, Niacin, Iron, Thiamin Mononitrate, Riboflavin, Folic Acid, Malted Barley Flour), Eggs, Salted Butter, Semi-Sweet Chocolate Chips (Sugar, Chocolate Liquor, Cocoa Butter, Soy Lecithin, Vanilla), Milk Chocolate (sugar, cocoa butter, whole milk, chocolate liquor, soy lecithin [an emulsifier], and vanillin)White Chocolate (sugar, cocoa butter, whole milk powder, nonfat milk powder, soy lecithin added as an emulsifier, vanilla and natural flavor), Vanilla Oil, Baking Powder, Salt. Nutrition Facts: Serving Size: 1 oz , Calories 117g, Fat Calories 46g, Total Fat 5g, Sat. Fat 3g, Trans Fat 0g, Cholest. 25mg, Sodium 67mg, Total Carb g , Dietary Fiber 0g, Sugar 11g, Protein 1g. Ingredients: Brown Sugar, Unbleached, Unbromated Wheat Flour (Wheat Flour, Niacin, Iron, Thiamin Mononitrate, Riboflavin, Folic Acid, Malted Barley Flour), Eggs, Salted Butter, Caramel Bits(Sugar, Corn Syrup, Liquid Sugar, Skim Milk, Palm Oil, Butter, Salt, Mono and Diglycerides, Soy Lecithin), Vanilla Oil, Baking Powder, Sea Salt. Nutrition Facts: Serving Size: 1 oz , Calories 112g, Fat Calories 41g, Total Fat 5g, Sat. Fat 3g, Trans Fat 0g, Cholest. 28mg, Sodium 225mg, Total Carb 16g , Dietary Fiber 0g, Sugar 10g, Protein 1g. Ingredients: Brown Sugar, Unbleached, Unbromated Wheat Flour (Wheat Flour, Niacin, Iron, Thiamin Mononitrate, Riboflavin, Folic Acid, Malted Barley Flour), Eggs, Salted Butter, Caramel (Sugar, Corn Syrup, Liquid Sugar, Skim Milk, Palm Oil, Butter, Salt, Mono and Diglycerides, Soy Lecithin), Toasted Sweetened (Desiccated Coconut, Sugar, Water, Dextrose, Salt), Coconut Oil, Baking Powder, Sea Salt. Nutrition Facts: Serving Size: 1 oz , Calories 121, Fat Calories 52, Total Fat 6g, Sat. Fat 4g, Trans Fat 0g, Cholest. 25mg, Sodium 68mg, Total Carb 15g , Dietary Fiber 1g, Sugar 10g, Protein 2g. Ingredients: Brown Sugar, Unbleached, Unbromated Wheat Flour (Wheat Flour, Niacin, Iron, Thiamin Mononitrate, Riboflavin, Folic Acid, Malted Barley Flour), Rolled Oats, Dried Cranberries (Cranberries, Sugar, Sunflower Oil), Eggs, Salted Butter, Cinnamon, Vanilla Oil, Baking Powder, Salt. Nutrition Facts: Serving Size: 1 oz , Calories 109, Fat Calories 39, Total Fat 4g, Sat. Fat 2g, Trans Fat 0g, Cholest. 28mg, Sodium 61mg, Total Carb 16g , Dietary Fiber 1g, Sugar 10g, Protein 2g. Ingredients: Brown Sugar, Unbleached, Unbromated Wheat Flour (Wheat Flour, Niacin, Iron, Thiamin Mononitrate, Riboflavin, Folic Acid, Malted Barley Flour), Peanut Butter, Eggs, Salted Butter, Vanilla Oil, Baking Powder, Salt. Nutrition Facts: Serving Size: 1 oz , Calories 122, Fat Calories 58, Total Fat 7g, Sat. Fat 3g, Trans Fat 0g, Cholest. 26mg, Sodium 110mg, Total Carb 14g , Dietary Fiber 1g, Sugar 9g, Protein 2g. Ingredients: Brown Sugar, Sugar, Unbleached, Unbromated Wheat Flour (Wheat Flour, Niacin, Iron, Thiamin Mononitrate, Riboflavin, Folic Acid, Malted Barley Flour), Peanut Butter, Cocoa Powder, Eggs, Salted Butter, Vanilla Oil, Baking Powder, Salt. Nutrition Facts: Serving Size: 1 oz , Calories 108, Fat Calories 38, Total Fat 4g, Sat. Fat 1g, Trans Fat 0g, Cholest. 21mg, Sodium 99mg, Total Carb 16g , Dietary Fiber 1g, Sugar 10g, Protein 1g. Ingredients: Sugar, Unbleached, Unbromated Wheat Flour (Wheat Flour, Niacin, Iron, Thiamin Mononitrate, Riboflavin, Folic Acid, Malted Barley Flour), Eggs, Salted Butter, Cocoa Powder, Semi-Sweet Chocolate Chips (Sugar, Chocolate Liquor, Cocoa Butter, Soy Lecithin, Vanilla), Vanilla Oil, Baking Powder, Salt. Nutrition Facts: Serving Size: 1 oz , Calories 111, Fat Calories 50, Total Fat 6g, Sat. Fat 3g, Trans Fat 0g, Cholest. 31mg, Sodium 73mg, Total Carb 13g , Dietary Fiber 1g, Sugar 9g, Protein 2g. Ingredients: Sugar, Unbleached, Unbromated Wheat Flour (Wheat Flour, Niacin, Iron, Thiamin Mononitrate, Riboflavin, Folic Acid, Malted Barley Flour), Eggs, Salted Butter, Cocoa Powder Caramel (Sugar, Corn Syrup, Liquid Sugar, Skim Milk, Palm Oil, Butter, Salt, Mono and Diglycerides, Soy Lecithin), Vanilla Oil, Baking Powder, Sea Salt. Nutrition Facts: Serving Size: 1 oz , Calories 112, Fat Calories 51, Total Fat 6g, Sat. Fat 3g, Trans Fat 0g, Cholest. 31mg, Sodium 220mg, Total Carb 15g , Dietary Fiber 1g, Sugar 11g, Protein 1g. Ingredients: Sugar, Unbleached, Unbromated Wheat Flour (Wheat Flour, Niacin, Iron, Thiamin Mononitrate, Riboflavin, Folic Acid, Malted Barley Flour), Eggs, Salted Butter, Cocoa Powder, Almonds, Vanilla Oil, Baking Powder, Salt. (Could contain dark, milk, or white chocolate chips) Dark Chocolate (sugar, chocolate, cocoa butter, cocoa [processed with alkali], milk fat, lactose [milk], soy lecithin, pgpr[(emulsifier], vanillin), Milk Chocolate (sugar, cocoa butter, whole milk, chocolate liquor, soy lecithin [an emulsifier], and vanillin)White Chocolate (sugar, cocoa butter, whole milk powder, nonfat milk powder, soy lecithin added as an emulsifier, vanilla and natural flavor). Nutrition Facts: Serving Size: 1 oz , Calories 118, Fat Calories 61, Total Fat 7g, Sat. Fat 4g, Trans Fat 0g, Cholest. 32mg, Sodium 77mg, Total Carb 14g , Dietary Fiber 1g, Sugar 10g, Protein 2g. Nutrition Facts: Serving Size: 1 oz , Calories 109, Fat Calories 47, Total Fat 5g, Sat. Fat 3g, Trans Fat 0g, Cholest. 33mg, Sodium 73mg, Total Carb 15g , Dietary Fiber 1g, Sugar 10g, Protein 2g. 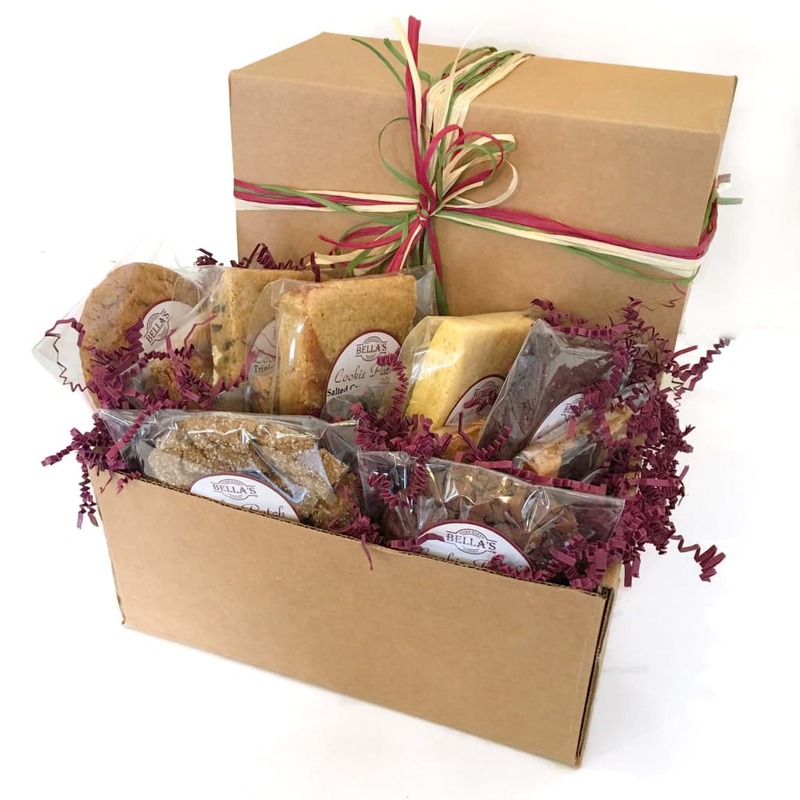 Ingredients: Sugar, Eggs, Unbleached, Unbromated Wheat Flour (Wheat Flour, Niacin, Iron, Thiamin Mononitrate, Riboflavin, Folic Acid, Malted Barley Flour), Semi-Sweet Chocolate Chips (Sugar, Chocolate Liquor, Cocoa Butter, Soy Lecithin, Vanilla), Salted Butter, Cocoa Powder, Coffee, Baking Powder, Salt. Nutrition Facts: Serving Size: 1 oz , Calories 109, Fat Calories 51, Total Fat 6g, Sat. Fat 3g, Trans Fat 0g, Cholest. 36mg, Sodium 70mg, Total Carb 14g , Dietary Fiber 1g, Sugar 8g, Protein 1g. Ingredients: Unbleached, Unbromated Wheat Flour (Wheat Flour, Niacin, Iron, Thiamin Mononitrate, Riboflavin, Folic Acid, Malted Barley Flour), Salted Butter, Sugar, Eggs, Lemon Oil, Baking Powder, Salt. Nutrition Facts: Serving Size: 1 oz , Calories 126, Fat Calories 56, Total Fat 6g, Sat. Fat 4g, Trans Fat 0g, Cholest. 23mg, Sodium 97mg, Total Carb 16g , Dietary Fiber 0g, Sugar 7g, Protein 1g. Ingredients: Unbleached, Unbromated Wheat Flour (Wheat Flour, Niacin, Iron, Thiamin Mononitrate, Riboflavin, Folic Acid, Malted Barley Flour), Sugar, Almonds, Eggs, Salted Butter, Vanilla Oil, Almond Oil, Baking Powder, Salt. Nutrition Facts: Serving Size: 1 oz , Calories 124, Fat Calories 58, Total Fat 7g, Sat. Fat 3g, Trans Fat 0g, Cholest. 18mg, Sodium 86mg, Total Carb 15g , Dietary Fiber 0g, Sugar 8g, Protein 2g. Ingredients: Unbleached, Unbromated Wheat Flour (Wheat Flour, Niacin, Iron, Thiamin Mononitrate, Riboflavin, Folic Acid, Malted Barley Flour), Sugar, Canola Oil, Molasses, Eggs, Baking Soda, Cinnamon, Ginger, Salt. Ingredients: Unbleached, Unbromated Wheat Flour (Wheat Flour, Niacin, Iron, Thiamin Mononitrate, Riboflavin, Folic Acid, Malted Barley Flour), Salted Butter, Sugar, Eggs, Sweet Peppermint Oil, Baking Powder, Salt. Ingredients: Rolled Oats, Dried Cranberries (Cranberries, Sugar, Sunflower Oil), Walnuts, Almonds, Chipped Coconut, Brown Sugar, Honey, Sugar, Salted Butter. Nutrition Facts: Serving Size: 1 oz , Calories 119, Fat Calories 53, Total Fat 6g, Sat. Fat 2g, Trans Fat 0g, Cholest. 2mg, Sodium 8mg, Total Carb 15g , Dietary Fiber 2g, Sugar 9g, Protein 2g.